If you’re on social media for any length of time, you’ll no doubt notice that people like quotes and images. A number of marketing studies on the types of content that gets shared the most confirms what you’ve noticed, namely that quotes and images are popular. In fact, a Twitter analysis conducted by Quicksprout of over 300,000 tweets from a sample of 1,000 users found that quotes receive more retweets than questions. And a study by Ipsos OTX found that images receive more shares on social media. It makes sense then to combine quotes and visuals if you want to create memorable and shareable content. Fortunately, you don’t need to be a graphic designer to create stunning visual quotes if you use any of the following text art tools. Recite offers quote templates pre-formatted with fonts, text layout and colors. 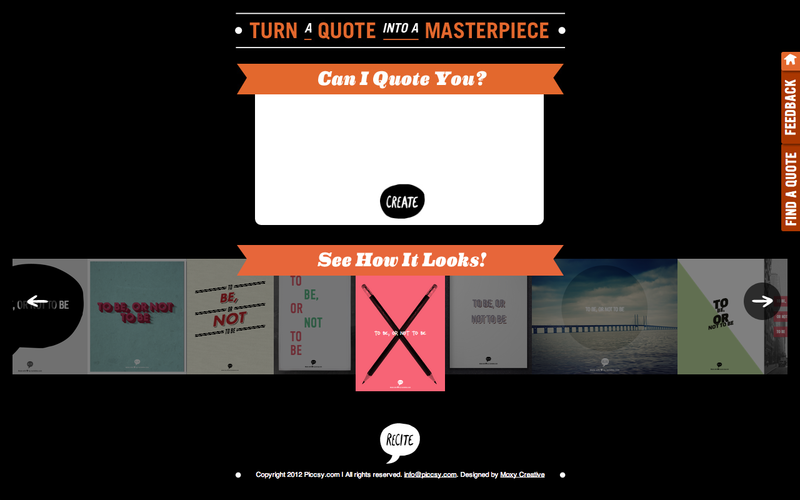 Users simply type in their quote and click “create.” The finished product can be downloaded, emailed, or shared on social media. If you can’t think of a good quote or don’t want to be bothered looking for one, just use Recite’s “Find a Quote” feature to get started. 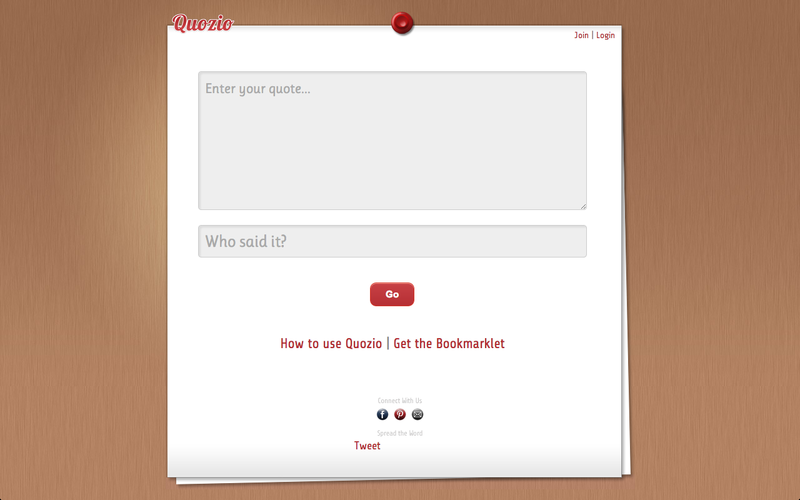 Quozio, like Recite, offers pre-formatted quote templates. Quozio differs from Recite by offering two separate text fields – one for your quote and a second for quote attribution. 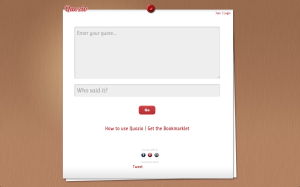 Quozio also differs by offering a special bookmarklet that lets users highlight any text they come across the web to begin creating visual quotes. Saving newly created visual quotes requires either saving the image directly from your screen or creating a Quozio account. Visual quotes can also be shared via email and social media. Share As Image is a Chrome extension and bookmarklet for turning highlighted text into visual quotes. 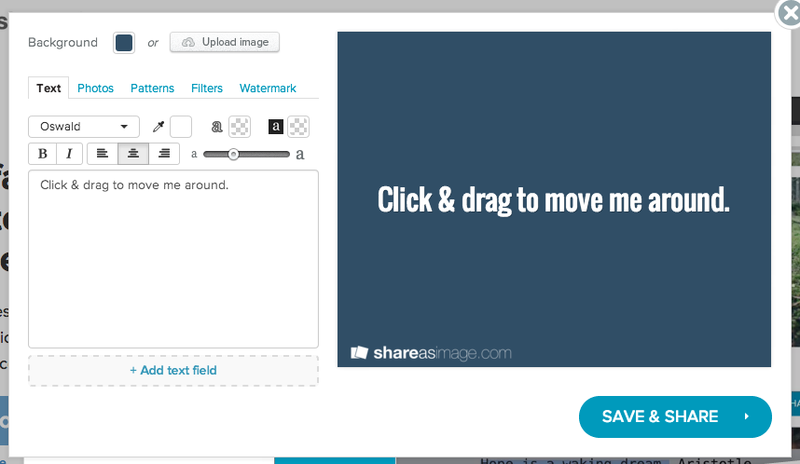 Share As Image provides additional features such as filters. Completed visual quotes can be downloaded and/or shared on social media. It should be noted that Share As Image operates on a freemium model, meaning that the free version offers fewer features than the paid version. The pro version costs $8 per month and provides a wider set of images and formatting options to choose from plus the ability to add a custom watermark. LiveLuvCreate was designed to appeal to a mostly teen audience. 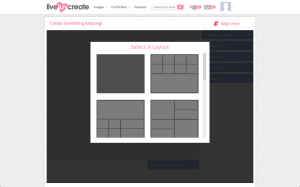 Since it was designed with mostly young users in mind,LiveLuvCreate offers a lot of options for customization. The site does require user registration, which is free. 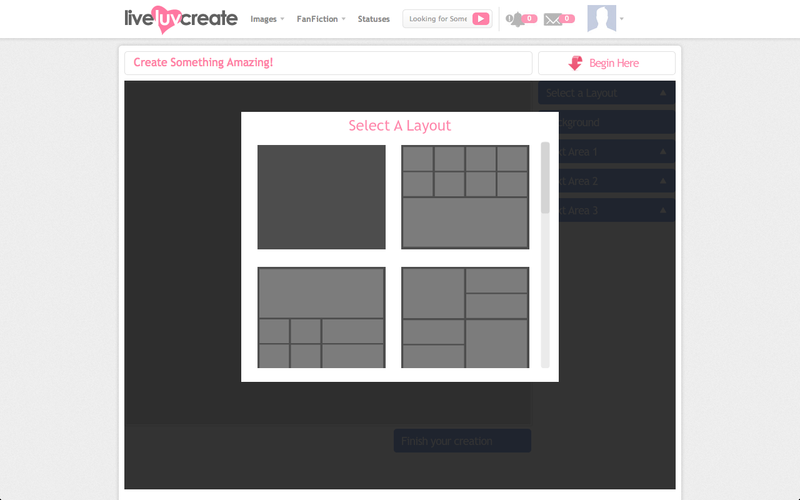 Once logged in, users can access several layouts and a large selection of background art, fonts, borders, and filters. Visual quotes can be created via the site or using a special bookmarklet. Completed works can be shared to social media and are saved in your account for direct download. Whims is a free visual quotes app for iOS devices. 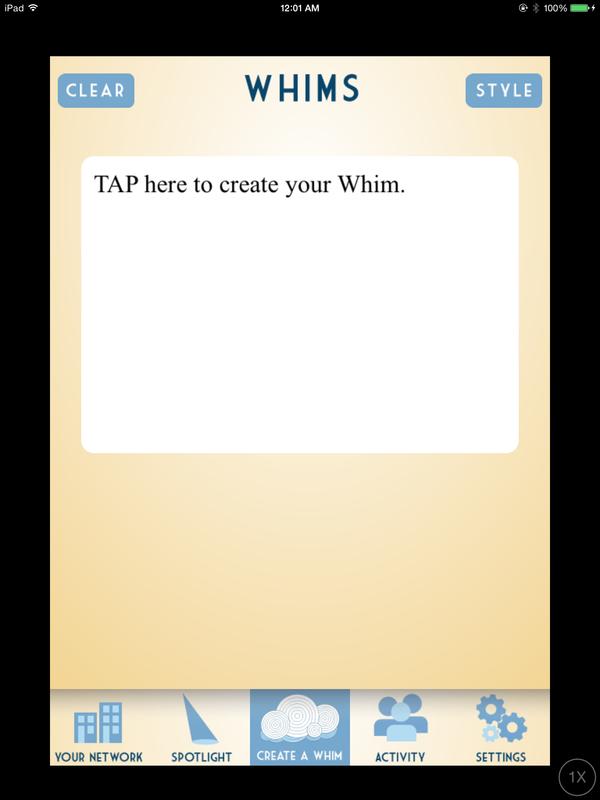 Using Whims requires creating a free account. Once registered, users simply click on “Create a Whim” to begin creating their own custom visual quotes. A text edit window then appears where users can type in their quote. The next step is to select the “Style” button to begin selecting fonts, font sizes and colors, text alignment, and backgrounds. Fonts, font colors and background color choices are based on the selected templates. The last decorative option is whether to add a texture to your background to make it seem as if your visual quotes, or Whim,has been written on paper or other hard surface. 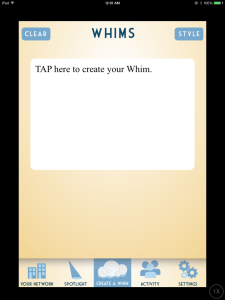 Completed Whims can be shared via text message, email or on social media. To save a Whim, users have to either email it to themselves for download or mark it private to save to their device. PicLab and PicLab HD are text overlay apps that can be used to create visual quotes. PicLab is free and works on iOS, Android, and Windows devices. PicLab HD is richer in features and built for iPad for $1.99. The purpose of both apps is to add text and graphic elements over your own photos. While neither app offers professional-grade images for your background, they do offer Instagram-like filters. Both apps also offer frames; graphic elements like banner ribbons and speech bubbles; and text effects. Finished visual quotes can be shared via email, text message, social media, or other apps on your device with image storing or sharing capabilities. 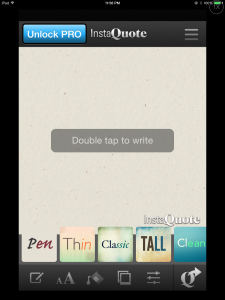 InstaQuote and InstaQuote Pro are text overlay apps for iOS and Android devices. Both apps open up by asking users to “Double tap to write,” whereupon a text editor with separate fields for your quote and attribution appears. From there, users may select a template with pre-selected text style and background or create their own design using an image from their device library. Users can customize font size, text spacing, alignment, and adjust image appearance. Finished visual quotes can be shared on social media, your device’s library, or other apps on your device with image storing or sharing capabilities. The similarities end there with the $2.99 InstaQuote Pro offering significantly more options for customization such as a library of professional grade image backgrounds and fonts in addition to more custom templates. Overgram is a free iPhone app for adding typography to photos. Overgram uses photos taken on your device or from your device library. Adding text is as easy as double-tapping on your screen. 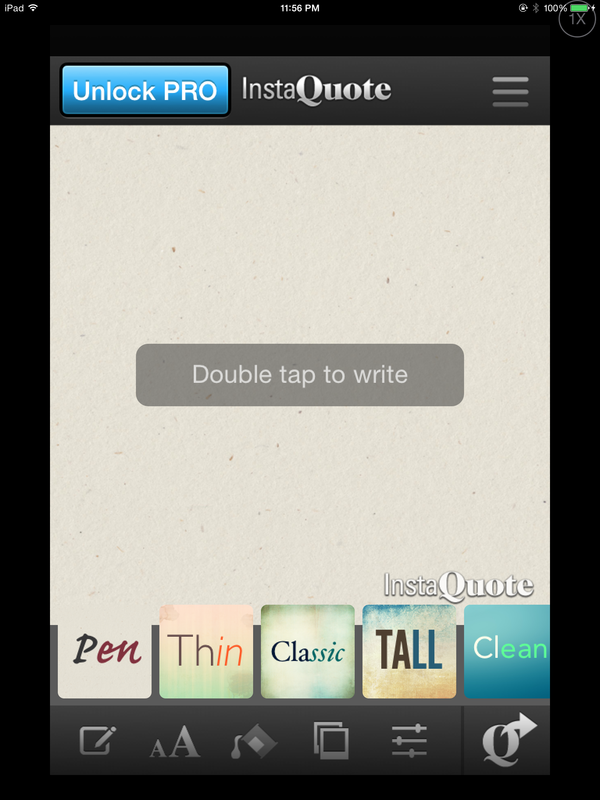 The app provides the ability to customize text alignment, color, size, and font face. Additional fonts can be purchased for $1.99. Completed images can be shared on any app on your device with image storing or sharing capabilities. Do you have any easy-to-use text art tools you’d recommend? Share them in the comments section below.